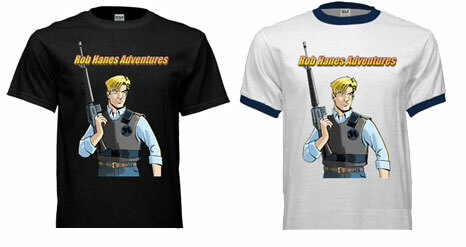 RHA T-shirts have always been available at the WCG Comics website, I’ve never really pushed them hard—in fact, they’ve been such a low priority, this is only the second new t-shirt design since 2005. I plan to have only a few on hand at the convention, so I welcome advance orders (be sure to tell me what size!) For the convention, each shirt is $20. Other goodies will include newly re-designed pin buttons and the RHA bookmarks that debuted in 2010. Both are free to longtime fans or with any purchase! At right: Yes, I have no shame--I even have my little boy promoting my comic-book! Before each year’s San Diego Comic-Con, I like to provide a behind-the-scenes look at my preparations for the show. Below is my first entry for this year’s Comic-Con, scheduled July 12-15, 2012. For once, I’m ahead of the game in my preparations for this year’s San Diego Comic-Con. Like a lot of publishers, I often work until the very last moment preparing a book for release at the show, pushing my printer’s deadlines to the limits. But this year I shipped the book off to the printer with plenty of time to spare, which gave me time to focus on other plans for the show. I planned to update my banner last year, but time ran out before I had a chance to conceptualize, let alone execute, a new design. I was very happy with the earlier banner, but thought that the light-colored background of the banner got lost in the convention hall. I think that the straightforward solid black background of the new banner will pop out more. 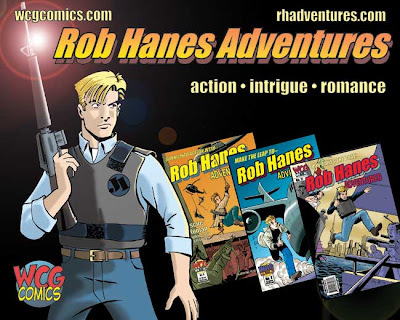 Though I didn't have a specific design in mind when I began planning the new banner, since I liked the shot of Rob on the cover Rob Hanes Adventures #13 turned out well, I decided to develop the new banner around it. Below is the original digital image that was submitted to the printer. I originally planned to use the figures from the Rob Hanes Adventures trade paperback (as seen on right) as the focus of the banner, but I found that the three figures made for a busy design. Bold and simple seemed the best way to go! The increased respect for comics and cartooning has resulted in a number of serious, in-depth biographies in recent years. I’ve previously reviewed several of them, focusing on Milton Caniff, Will Eisner, Noel Sickles, and Alex Toth. 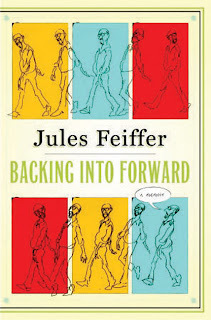 This is a review of Jules Feiffer’s autobiography, Backing into Forward: A Memoir (2010). Jules Feiffer has been always proud and foremost to identify himself as a cartoonist, but he is of course much more than that: author, children’s book writer, comics historian, playwright, and screenwriter. His foray into other media—partly driven by a need for alternative artistic expression but also to make a living—has never been by design and often accidental. Hence the title of his book. Though I’ve always been aware of Feiffer—particularly his long-running syndicated self-titled strip, Feiffer, in the Village Voice that was discontinued in 1997—his other work has also made it on my radar. These include his ground-breaking Great Comic Book Heroes which arguably helped renew interest in comics and introduced a new generation (myself included) to Will Eisner’s Spirit; and his film work, including Carnal Knowledge (which I saw in college) and Popeye. (He reportedly also wrote an unproduced script for Terry and the Pirates, which I’ve always been curious to track down and read.) As a young junior high school student who was an aspiring cartoonist, I especially enjoyed his personal anecdotes in the Great Comic Book Heroes about breaking into the comics biz as an assistant to Eisner and what was it like at the dawn of the comics age. My initial interest in Backing into Forward was to read about his years in Eisner’s studio. Though this transformative experience got him into comics, it was just the beginning of what would be a productive and diverse career. Especially fascinating are his stories of New York in the 1950s and ‘60s when he came of age professionally and the city was still the center of much of the art, entertainment and publishing world. 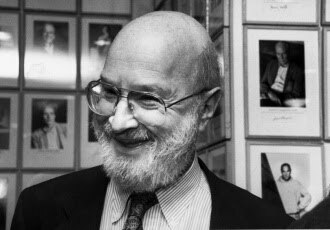 Intellectuals, playwrights, actors, movie directors and, yes, cartoonists like Feiffer seemed to mingle and cross-pollinate easily. Feiffer’s anecdotes of working and interacting with people like actors Dustin Hoffman, Jack Nicholson and Alan Arkin (who was the first to successfully crack the code on one of his earliest plays), producer Robert Evans, and directors Mike Nichols and Robert Altman (on the ill-fated Popeye) make for fascinating and amusing reads. A proud and unabashed old-school lefty, Feiffer also expounds at length on politics. (Nevertheless, Feiffer was not radical enough even for his sister, who was a self-declared communist.) He speaks at length of the upbringing that shaped his views and neuroses, which included a difficult mother who was slow to praise or encourage and a father who ceded all authority to his wife rather than risk challenging her. As Feiffer mentions in his book, his success was often built on the ashes of some failure. Now in his 80s and looking back on a life and career that was sometimes more happenstance than by design, he remains as opinionated as ever, but has found happiness and comfort in his own skin as a parent, writer and artist, and now a college teacher.